This versatile plant will screen out the neighbour or an unwanted view. Make sure you plant them where you can take full advantage of the stunning flowers over Christmas or the delicious fruit from autumn to early winter. Will grow well in a container for many years providing you provide plenty of moisture and feed. The fruit has good levels of Vitamin C (50mg/100mg of flesh) and dietary fibre. One fruit will provide 23% of an adult's daily need. Year 3 plant approximately yield 2kg of fruit then doubling each year until 20 to 25kg of fruit. Prefers to grow in full sun light. Will tolerate most soil conditions from heavy clay soils through to light sandy soils. Flowering occurs at the base of new seasons growth it is therefore important to prune early in the season (if pruning is required) to ensure growth happens for flowering to occur. Pruning is required to maintain the desired shape and stimulate to produce more flowering wood. 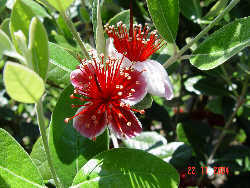 It is also required to open the tree up so birds can have easier access for pollinating. Remove weak and damaged branches back to the main branch and thin the tree, if required, by removing internal branches back to the main trunk. 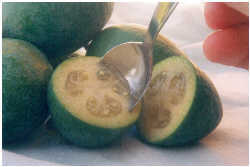 Feijoas are fairly Pest and Disease free. Leaf rollers, scale and thrips can attack feijoas and if sever attack occurs can be controlled with insecticides available through your local garden retailers. Sooty mould is a secondary attack after sap sucking insect have attacked the plant. The best way to cure the problem is by spraying for the insect attack. Soapy water will help shift the sooty mould if required.